We get a Worf-centric episode that finally doesn't have too many story lines crammed into it. The Enterprise is ordered to intercept an important, secret emissary who has been launched into space in a class A probe. The emissary, the half-human, half-Klingon K'Ehleyr, turns out to be Worf's old flame. I'm not sure why she had to be shot out into space in a probe (I know, the base didn't have any space ships - really?). I figured the writers were tired of picking up people in the good old-fashioned way. A probe let them tractor beam things and have K'Ehleyr show up in a cool get-up. The variety of sparkly jumpsuits was one of the fun things about this episode. K'Ehleyr has arrived in order to deal with a Klingon ship, the T'ong whose crew have been in a cryogenic sleep for 70 years. It is an interesting concept that various races could be in cryo-genesis and might not know that wars have been settled. It is a bit irresponsible to lose a ship like that and it makes sense that they might wake up ready to fight. Though you might think it was a good idea to check when you woke up if the world had changed at all. I had mixed feelings about the Klingon love affair. It was interesting to see more of Worf and how he might handle a relationship. It was also fun to watch the "iceman" be so awkward. 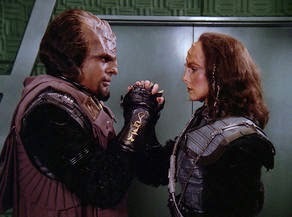 I'm not sure I liked the Klingon courting and mating. I understand that they are a violent culture and that women are as violent as men but K'Ehleyr was still the one who ended up bleeding. So I have mixed feelings. I did enjoy the fact that Worf felt both emotionally and honour bound to take a marital oath with K'Ehleyr (it seemed very Worf) while she refused him, thinking more about their careers than honour or feelings. The other interesting piece of this episode was the discussion between Troi and K'Ehleyr about their experiences of being 'mixed race' children. I can imagine that it was harder to be half human in Klingon society than in Betazoid although having less psychic ability than those around you might be difficult. The other fun part of this episode, besides the jumpsuits, was the subtle humour throughout. A funny Klingon is most amusing. K’Ehleyr is quite happy to blow the Klingons out of the sky without much thought. I appreciated that Troi talked about K’Ehleyr’s anger in a positive way, as giving her strength. Handy that they had appropriate Klingon attire on board.